Skunk2 Fender Washers were designed to replace the factory hardware with stainless steel bolts flush-mounted inside of our unique, hard-anodized aluminum washers. 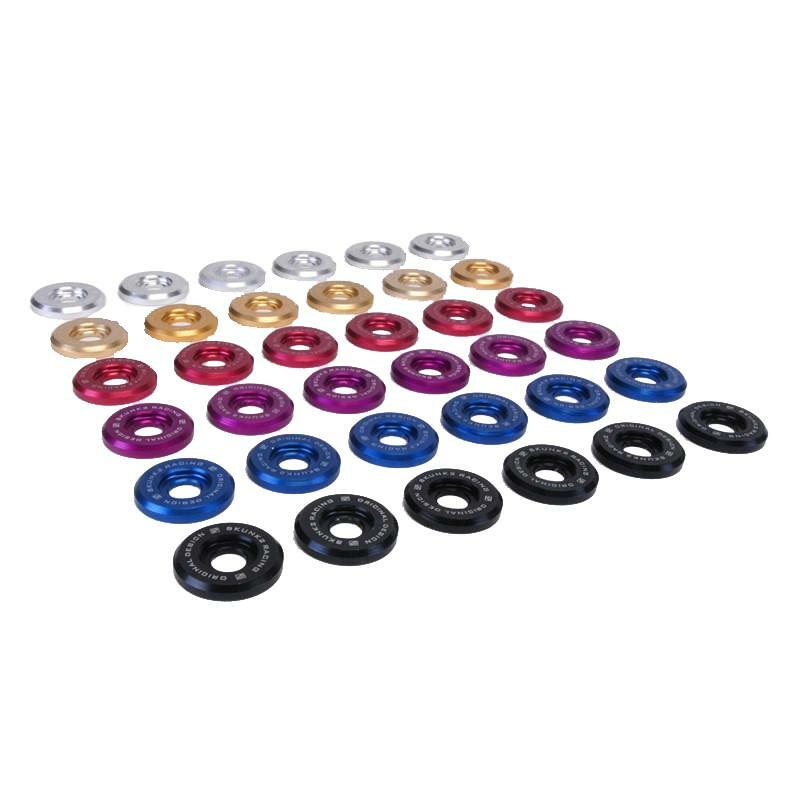 Each kit includes six low-profile washers, available in 20mm and 16.8mm diameters, and six flush-mounted, stainless steel bolts. Skunk2 Fender Washers are direct replacements for many Honda components that utilize 6Mx1.0 hardware, like fenders, headlights, radiator stays, hood hinges, and more. Only Skunk2 Fender Washers offer the most low-profile washers and bolts around, measuring more than 75% thinner than the factory washer and bolt combination. Skunk2 Fender Washers are manufactured from 6061-T6 aluminum, include high-quality, grade 10.9 metric bolts, are available in black, blue, gold, purple, red, and clear hard-anodized finishes, and feature Skunk2’s classic, laser-etched logo. Skunk2 employs the same design and manufacturing methods for all of its Fine Tuning accessories as it does for its top-of-the-line racing components. Skunk2 Fender Washer Kits help put that unique finishing touch onto the vehicle you work so hard to make perform well, and we make every effort to ensure that their style is consistent with our rich racing heritage.